Gender-based violence (‘GBV’) is a persistent threat across South Africa, with extremely high rates across the country. It has been estimated at costing the country between R28.4 – R42.4 billion per year, or between 0.9% and 1.3% of our GDP annually. Further, the NSP on HIV, TB and STIs (2017-2022) states that GBV is a significant driver of HIV acquisition among women, including community attitudes and lack of safety in permitting this. The Western Cape itself has been identified as one of the most unsafe provinces in South Africa. A third of the country’s murders have been reported at WC police stations. During the 2016/2017 year, murder increased by 2.7%. Sexual assault increased by 6% and robbery with aggravating circumstances increased by 1.3%. Within the Western Cape, Gugulethu has been identified as one of the worst ten precincts. 238 sexual offences, 173 rapes, 618 assaults with the intent to inflict grievous bodily harm and 720 robberies with aggravating circumstances were reported in 2017 alone. 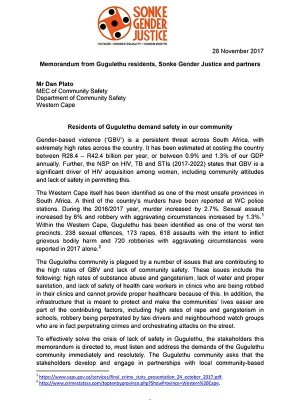 On Tuesday 28 November 2017, Sonke and other civil society parters marched to Nyanga Police station to draw attention to the high rates of gender-based violence in the Gugulethu community and to reiterate our urgent demand for government to implement a National Strategic Plan on gender-based violence. We are calling on our government to improve the safety of its citizens, particularly in informal settlements. We need better street lighting, better police response and resources, safer sanitation and more. Then handing over of this memorandum to Mr Dan Plato, MEC of Community Safety will be followed up with a meeting with the Department of Community Safety, Western Cape on 26 January 2018 in order to track progress of the community asks.